Nothing says sleep-deprived like a toddler in your bed. 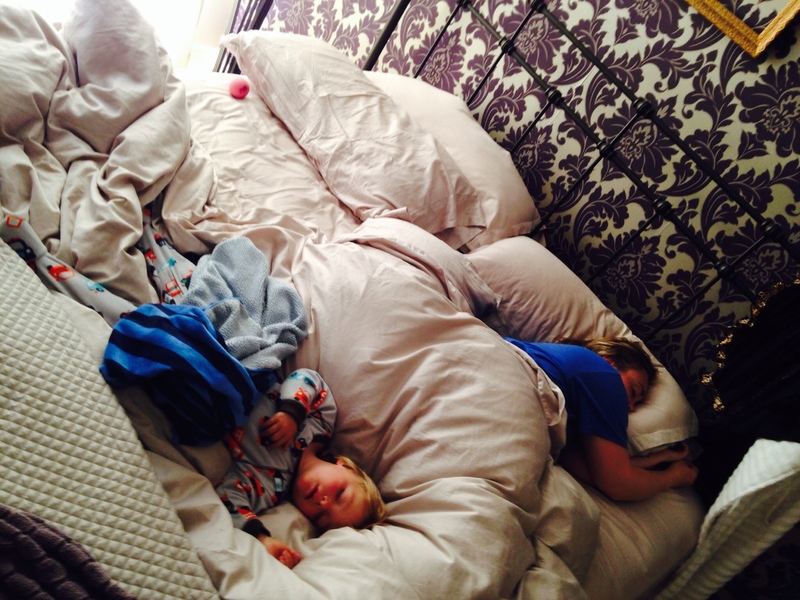 The plan was to put the boys in the same room as soon as the baby could sleep through the night – one in the big beautiful crib, one in a brand new car bed sized for toddlers. When we first made the transition, everyone was into it. The car bed was accepted after a few days of convincing and some reverse psychology; the baby was more than comfortable in the crib. We felt like we succeeded. Until the baby started teething. The stretches of sleep got shorter as the bottom two teeth cut simultaneously through his gums. And the toddler who does not like to hear his brother cry woke up with him. It was exhausting for all of us. Needless to say, when my big boy toddled into our room at 6 am with his blankie, it wasn’t hard to convince him to collapse in our bed for another couple of hours. And when I asked him if he likes sleeping in the same room as the baby, I wasn’t surprised to hear his no.